Drilling encountered two significant intercepts in Hole-007 and confirmed a depth extension of over 35 meters (over 115 ft.) of new mineralization below a previous Inco intersection. The mineralized zone continues to be open at depth and additional drilling to undercut Hole-007 is warranted. Mountain Lake Resources Inc. (TSX-V: MOA and OTC US: MLKRF) ("Mountain Lake" or the "Company") is pleased to report results from the first three holes of the current drilling program on the Company's 100% owned Bobby's Pond base metal (Zn-Cu + Pb-Ag-Au) project. The purpose of the current drilling program is to increase the tonnage of the deposit at depth, to determine the geometry of the deposit's volcanogenic massive sulphide (VMS) mineralization with regard to its proximity to surface, and to update the National Instrument 43-101 compliant mineral resource estimate. 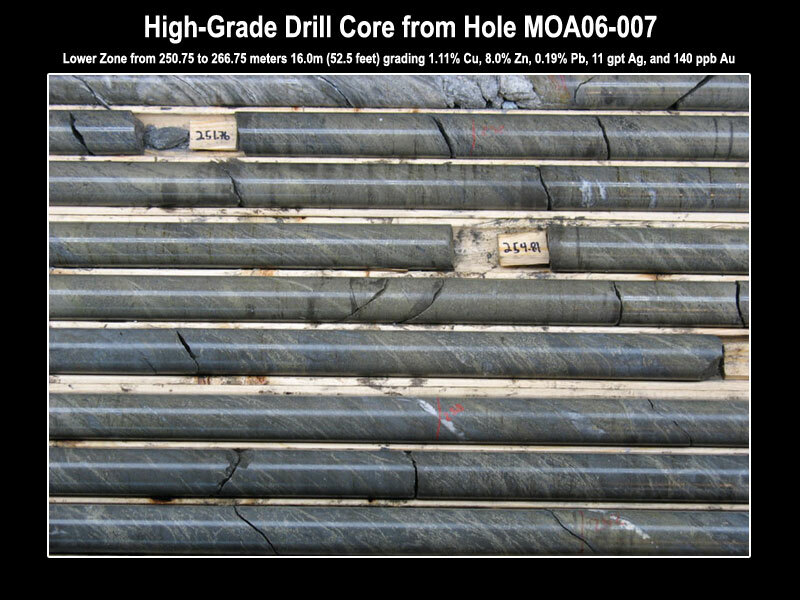 Hole MOA06-006 encountered a massive sulphide lens over a 2.5 meters (8.3 feet) length grading 1.08% Cu immediately below the "marker rhyolite" horizon (used to correlate the geology across the limits of the current drill grid). Hole MOA06-007 (Hole-007) was designed to determine the depth extension of a mineralized zone previously discovered by Inco (Hole 77546). Two significant intercepts were encountered in Hole-007: a 10.05 meter (33 feet) upper zone grading 1.28% Cu, 0.01% Pb, 0.78% Zn, 7.19 g/t Ag and 134 ppb Au; and a 16.0m (52.5 feet) lower zone grading 1.11% Cu, 8.0% Zn, 0.19% Pb, 11 gpt Ag, and 140 ppb Au. In addition, Hole-007 has confirmed a depth extension of over 35 meters of new mineralization below Inco's intersection. This depth extension has returned both higher values and longer intercepts when compared to the Inco hole. The mineralized zone continues to be open at depth and additional drilling to undercut Hole-007 is warranted. MOA06-008 was drilled to determine the near surface extension of the mineralization located 50 meters east of drill hole MOA06-06. In addition to intersecting the massive sulphide mineralization, 7.5 meters (24.8 feet) grading 2.2% Cu and 3 meters (9.9 feet) grading 3.15% Cu, the "marker rhyolite" unit continued to provide a reliable geological control. 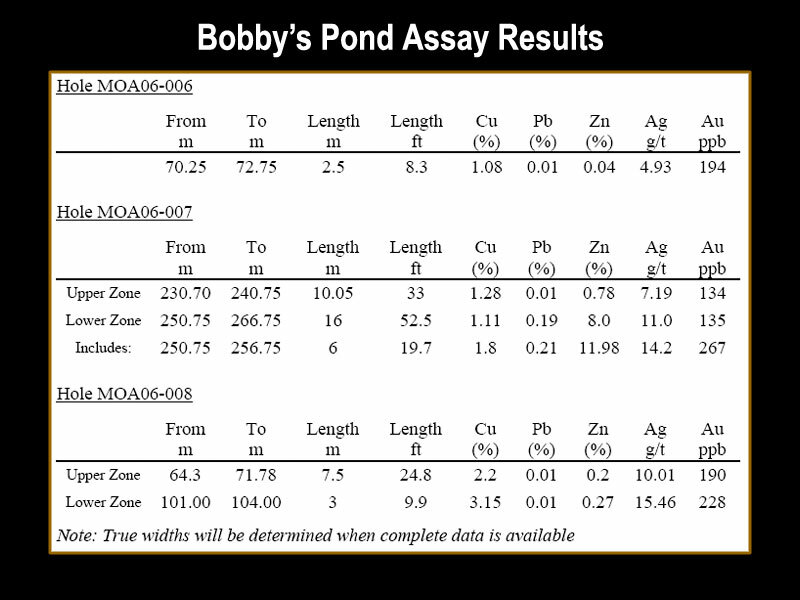 Based on the current work by Mountain Lake and previous INCO data, the deposit at Bobby's Pond consists of both a copper-rich zone and a parallel zinc-copper rich zone. See attachment (right) for detailed assay results for the three holes referenced above. With respect to diamond drilling, sample analyses and quality assurance/quality control procedures: all holes are NQ sized core which have been photographed, logged, and diamond saw cut at the core logging facility located in Buchans, Newfoundland. Half of the core is submitted to Eastern Analytical Laboratories in Springdale, Newfoundland for analysis for base metals (zinc, copper, lead and silver) with an AA finish. Gold is analyzed by 30 gram Fire Assay. QA QC procedures involve the inclusion of Standards (1 in 20), Blank Samples (l in 20), and Sample Duplicates (1 in 20) using Eastern Analytical's internal Standards and Blank Samples. Additional assay results will be reported as they are received. The National Instrument 43-101 Technical Report and mineral resource estimate will be updated by Scott Wilson RPA Inc., consulting geologists, once all results from the current drilling program have been received. The Bobby's Pond project (Mining Lease 187/4881M) is located in the Buchans area of central Newfoundland, renowned for the historic Buchans Mines (Production 1928-1984) and host to several other active massive sulphide projects. The most advanced of the current projects is Aur Resources' Duck Pond deposit which will begin production before year end. The Bobby's Pond deposit is located approximately 45 kilometers west (by road) of the Duck Pond mine/mill operation. Mountain Lake Resources Inc. (TSX-V: MOA) is a diversified junior mining and exploration company whose corporate strategy is to build shareholder value through the exploration and development of economically viable mineral properties. Current projects include: a 100% interest in the Bobby's Pond Base Metal Project; the Valentine Lake Gold Project, in which Richmont Mines Inc. is earning a 70% interest; and a 25% stake in Etruscan Diamonds (Pty) Limited of South Africa, a producing diamond miner. The TSX Venture Exchange has not reviewed and does not accept responsibility for the adequacy or accuracy of the content of this news release. We seek safe harbor.